The best place to succeed is where you are with what you have . 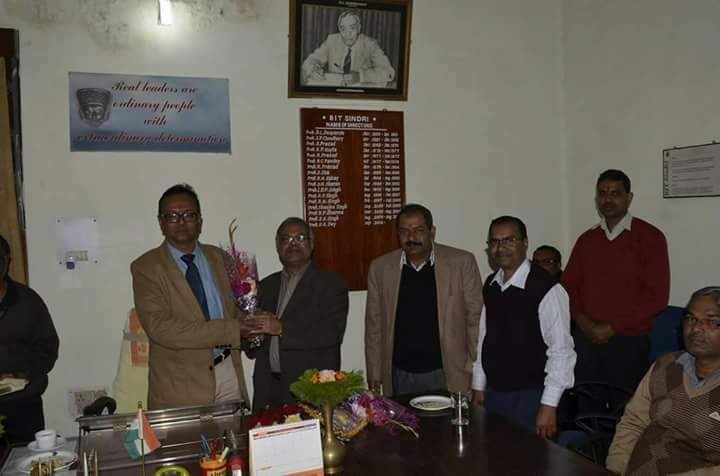 ​21st January 2017, a momentous day when BIT welcomed its new director Dr. D. K. Singh at his Alma mater. Erstwhile he served as the head of the electronics and communication engineering department at NIT Patna. Dr Singh, who completed his B-Tech and M-Tech from BIT-Sindri itself, is credited for launching the information and technology department at the college. The college witnessed a series of drastic changes in developments and added to the glorious annals of the institution during the past one year of his tenure. 3.SAIL R&D center, Ranchi for Industry collaboration. 5.IIT(ISM) Dhanbad for Academic collaboration to Promote Research and Teaching. 7.MyPerfectice E Pvt Ltd for soft skill Development, GATE, CAT and other Aptitude test to enhance employability. Another MOU is likely to be signed within a few weeks with Yamaha Soft to promote entrepreneurial developments. The Government has also assured to set up 14 CoE Labs in collaboration with Siemens India Ltd.
Apart from technical advancements, infrastructure has also undergone privileged renovation, departmental buildings are on the verge of repair ,hostels have been repaired, or are undergoing the same to provide apt facilities to the students,and various new buildings are on high construction to boost infra .In his urge to transform BIT to better BIT, he aims at modernising it in every way possible. Flaunting his conviviality and enthusiastic participation in students’ activities, he has tried to anchor the students in all possible ways. His efforts have brought the institution on the front of technical development and aspiring success. We therefore congratulate him for fruitful aftermath of his arduous efforts and for continually inspiring us with his charismatic persona. Though it’s still a long way to go, firm initiatives and utter devotion are credulous enough to achieve the desired goal of restoring its past glory. The title itself suggested that it’s from sarjana. You know it when you don’t understand it.